Archaeological finds, including a Neolithic polished stone axe (found to the south of the current village) and a Bronze Age barrow (to the north), suggest there has been a settlement here for thousands of years. A Roman villa was discovered in 1842. The village was mentioned in the Domesday Book as Cumbertone, and clearly dates to at least the 11th century. Some houses in the village date from the 14th century. 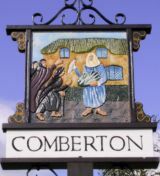 Comberton has a population of about 2,300 (as of 2006). It features two churches: the Church of England St Mary's, an Early English-style building dating from the 13th century, and a Baptist church dating from 1861. It also has one pub, shops, a primary school and a post office, a recreation ground, a doctor's surgery, a dental surgery, and at the centre of the village, a village pond with resident ducks. The cache is not near the village sign. Do not go climbing all over the sign! You can get the clues from standing quite some way away!